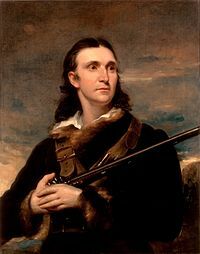 What would John James Audubon have made of the transformation of his Manhattan estate in the years since his death in 1851? He called the 44-acre property Minnies Land in honor of his wife – her name was Lucy, but Minnie was a Scottish endearment, the term for Mama, and it was what he and the couple’s two sons had begun to call her when they lived in Scotland in the 1830s. 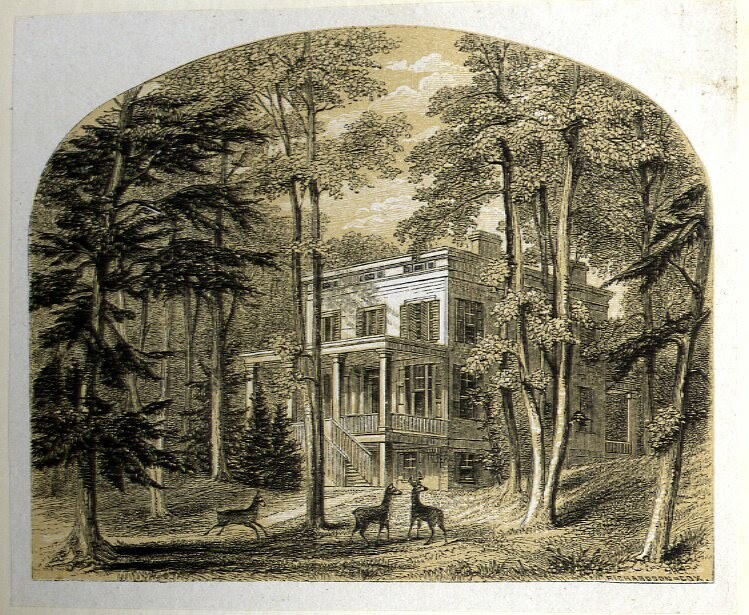 In 1842,with funds from Birds of America, the Audubons bought the property and built a sprawling house on the Hudson River’s bank, near a lively stream. If there were city streets there then — so far they were only parallel lines on a surveyor’s map — the house would have stood in the vicinity of 157th or 158th. Two piazzas (the then-name for verandas) opened from the gracious two-story structure, which at some point got a mansard roof and a new bay window. It could be that Samuel Morse, a friend of Audubon’s, sent the first telegraph message across the Hudson from a laundry room in the basement. It was a place where things happened, because things were always happening around Audubon. 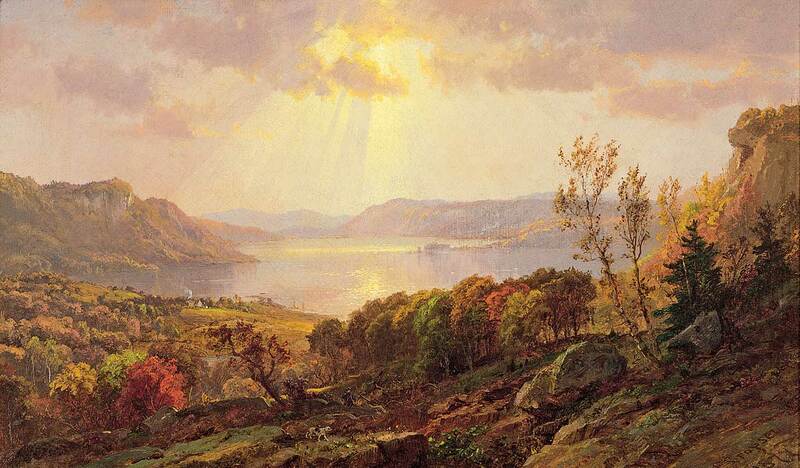 The environment was more like a Cropsey canvas than anything associated with metropolitan New York (the Hudson River School genius painted this one around West Point in 1877). Even then, the city proper stood miles downtown, at the tip of Manhattan. The estate “consisted of forty-four acres, all heavily wooded, and at that time was almost as remote from the city as a lodge in the Catskills,” wrote one historian in 1902. 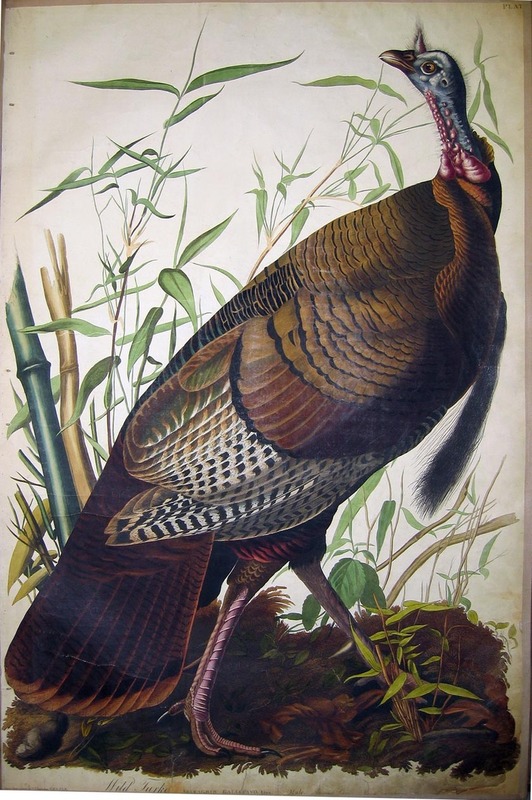 A good place for bird hunting, if you were a man in need of a spectacular looking turkey. Not an inch of Minnies Land remains today, but we went looking for clues, snippets of the past in a jostling, randy, determinedly contemporary neighborhood. We started with Audubon’s burial site, under a towering local-bluestone obelisk in Trinity Cemetery at Broadway and 157th Street. Elaborate carving shows bas relief critters on each side of the piece, land-mammals on one side and creatures of the air on the other. 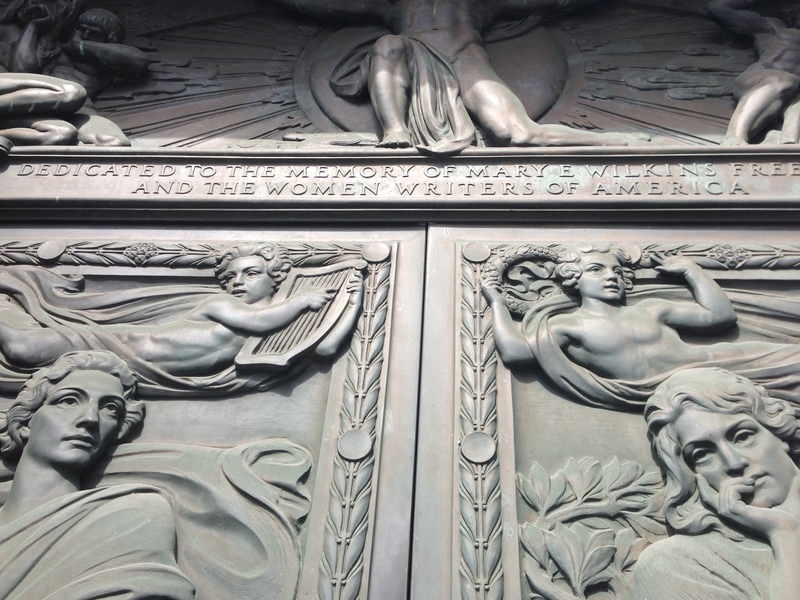 Fittingly, while one plaque shows painterly accessories, a palette and a brush, its twin on the reverse of the monument gives the gritty equipment with which Audubon accomplished his goals. 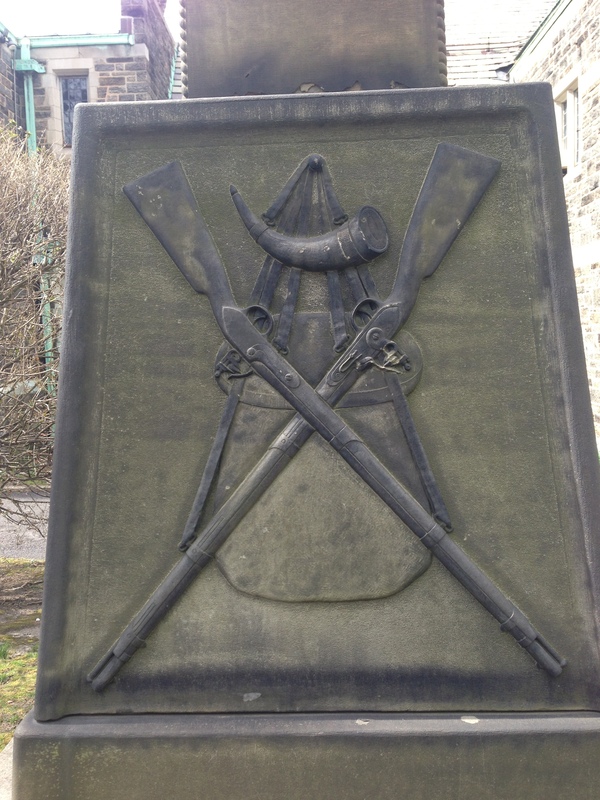 A few daffodils reared their heads amid the stones for Woodruff, Corbin, Mayer and Smith, so many Smiths, it seemed, all the early New York names. And in another part of the cemetary (bisected when Broadway came through in 1868) lies Charles Dickens’ son, struck down by a heart attack in 1912 when on a lecture tour in the U.S. on the centenary of his father’s work. The terrain of Trinity cemetary is the one feature in the neighborhood not changed in the nearly two hundred years since Audubon settled his family here. Rough, craggy, sloping steeply down to the Hudson, the graveyard was a favorite destination for Manhattanites, who loved to drive uptown in their carriages to stroll here. Since 1932 a grand apartment house, 765 Riverside Drive, sits where the Audubon house did, and it is cut off from the river by the Riverside Drive viaduct, which came through in 1911. Then, the house sat some 50 feet below the current street level, on the river bank, and the new highway buried it almost completely. 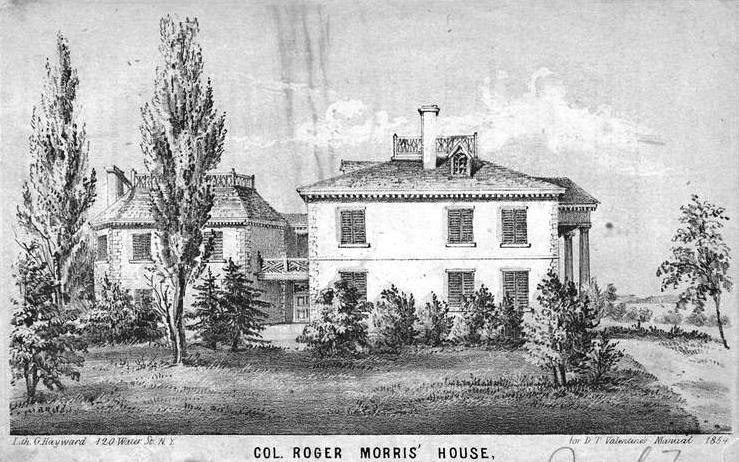 The gracious old house was eventually moved, then demolished. When her husband died, Lucy and her sons had begun selling off parcels of the estate to make ends meet – there were 14 grandchildren to support – and 10 happy owners became part of a development known as Audubon Park. Lucy, residing nearby, outlived her husband and her sons. On the next block, the reverse of the building sports more etched mottos. Milton. A good book is the precious life blood of a master spirit. And, with no citation but from Edwin Arlington Robinson. I’m in need of a new personal motto and that one seems just fine. Another legend, one more in keeping with the present spirit of the locale, had been pasted up on the locked doors below: No sidewalk or street barbeques allowed. Audubon Terrace, a Beaux-Arts complex that houses the American Academy, also is the site of the Hispanic Society of America Museum, seemingly unchanged since it opened in 1908, except for dozens of empty display cases, which will one day soon be filled, hopefully. Still, there are new coats of terra cotta paint to match the gallery’s burnt-sienna floor tiles. Here you can see a sheaf of works by Goya and El Greco and Velasquez, along with curiously beautiful objects. 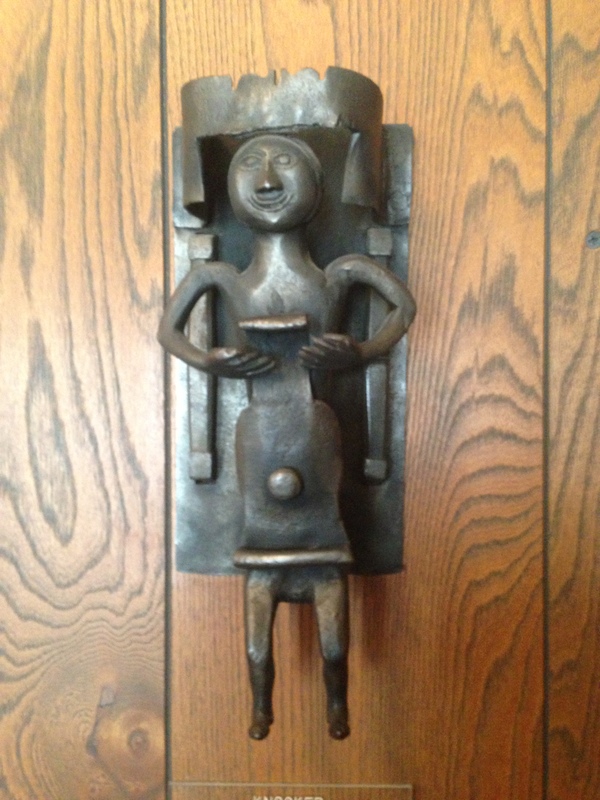 Door knockers dating to 1500. 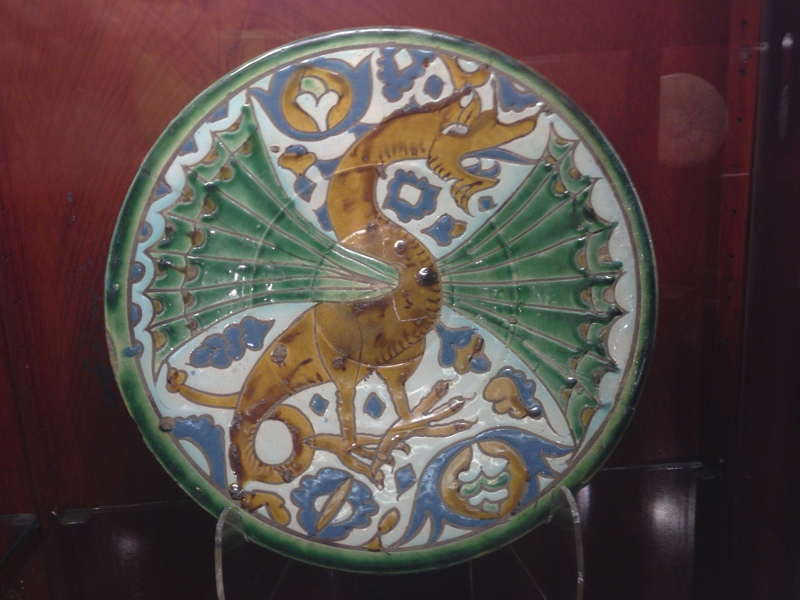 Ceramics, tin-glazed earthenware, of dragons, which were real in the middle ages. 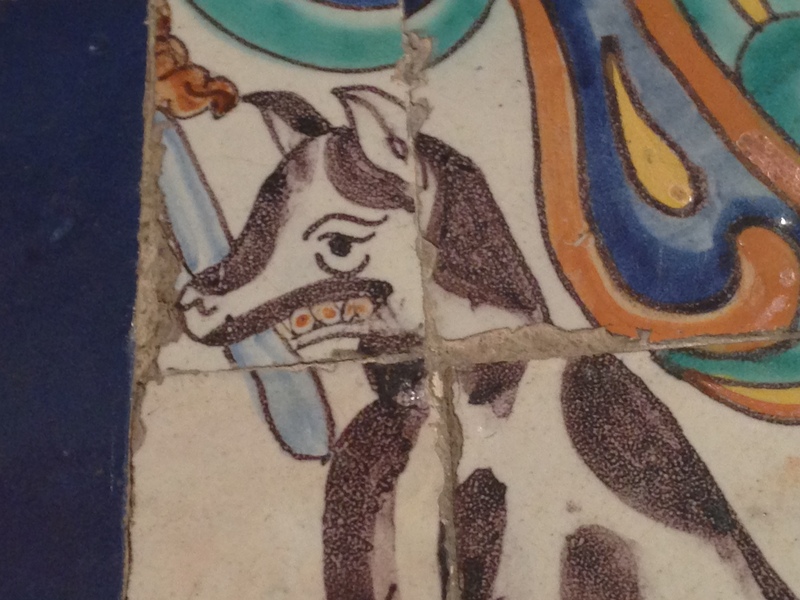 Tiles, this one depicting one of Oliver’s ancestors. 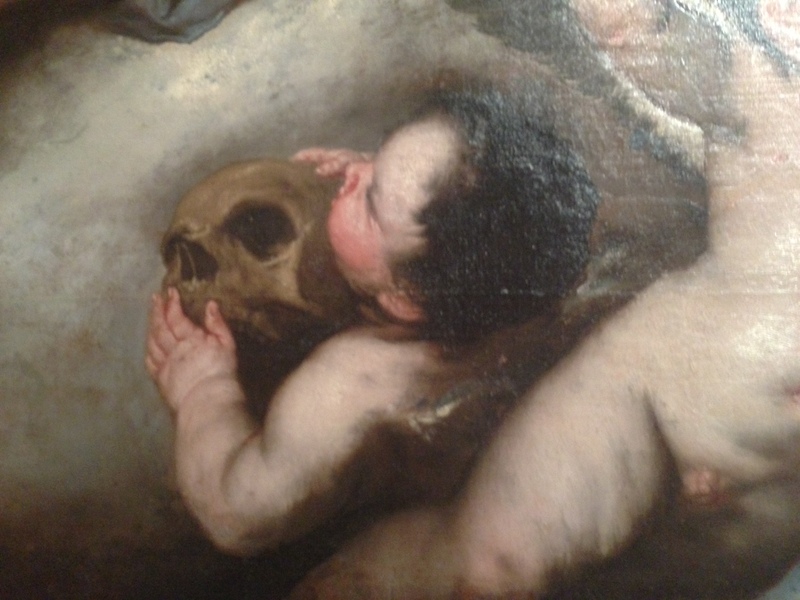 Infants embracing skulls, from about 1700. 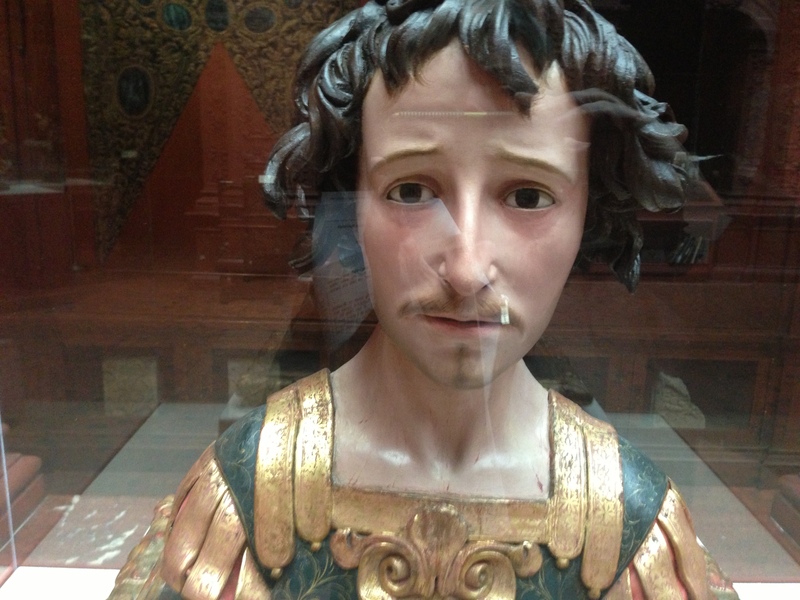 And a Saint Acisclo so vivid you feel he’ll step out of 1680 and shake your hand. 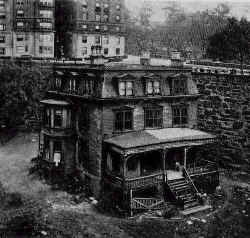 A visit to Minnies Land would not be complete without a visit to the Morris-Jumel mansion, “your house,” as my brother told me, since my book The Women of the House concerned itself in part with Mary Philipse and Roger Morris and the adventure of building their home on a bluff overlooking the Harlem River in 1765. Later the home made the perfect headquarters for General Washington, who could stroll around this high perch and be able to sight miles in every direction, planning military campaigns all the while. When Audubon took up residence at Minnies Land, the Morris House was still probably the only place nearby you could go to get a cup of sugar. 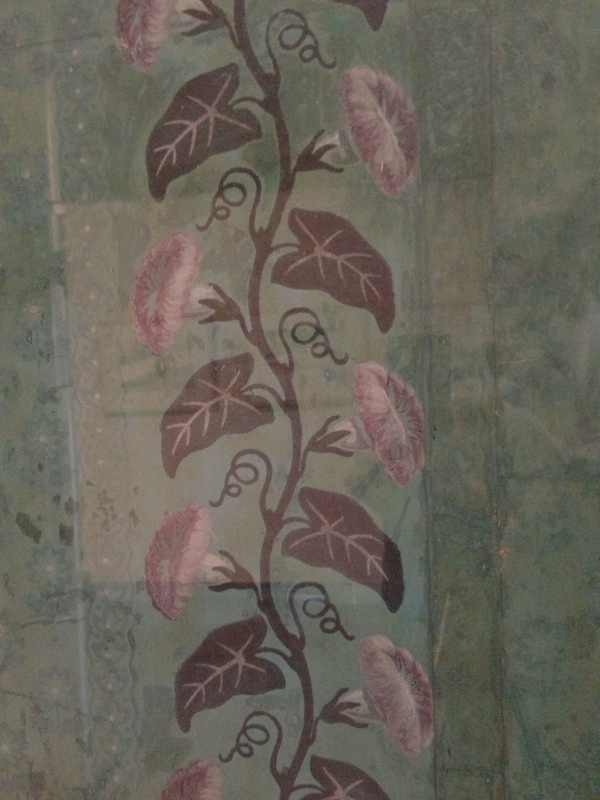 Perfectly preserved, the house offers a display of morning-glory wallpaper, velvet, circa 1820, handblocked and flocked to within an inch of its life. And there is the famous octagonal drawing room, said to be the first in America, then called a withdrawing room, that I was once lucky enough to give a talk in. Walking back to the car, we passed by J & F Meat Market, Iglesia Pentecostal and Flaco’s Pizza, the sidewalks bathed in dog waste. A church lady making her way home in a purple hat. 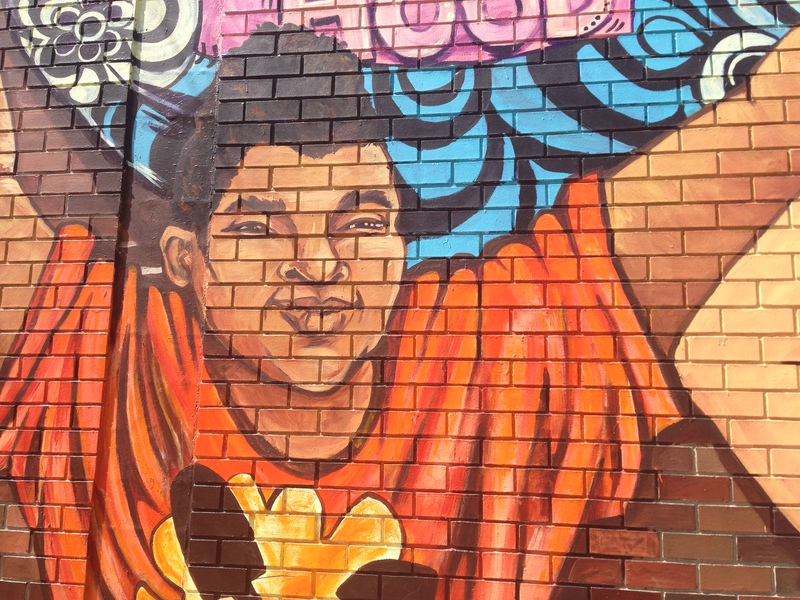 A bold mural. Everything was blowing up in the cold spring wind. There’s not. And that’s hard to take. But we can still imagine it. 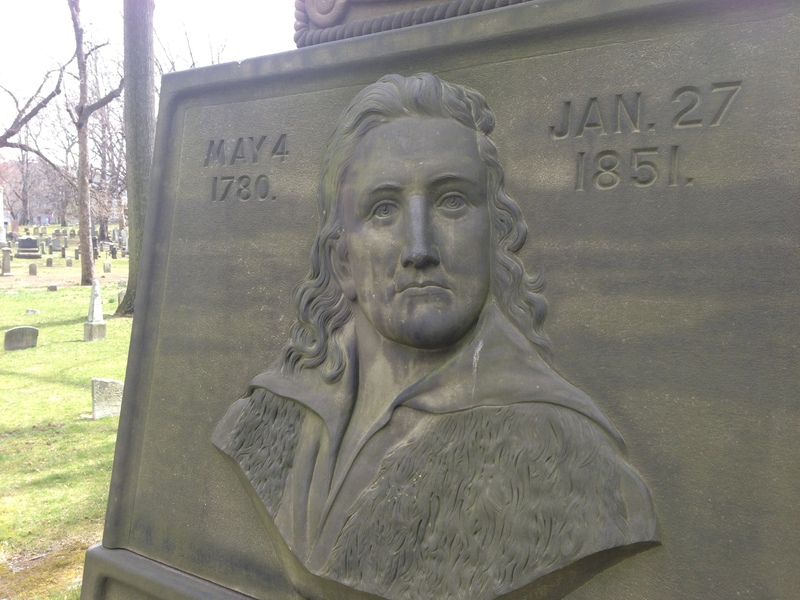 The corner of Trinity Church Cemetery where Audubon is buried is at Broadway and 155th street, not 157th street (where a 10 story apartment building stands on the southeast corner). And the Riverside Drive Viaduct section was completed in 1928, not 1911. Thanks for the TOUR… I click on all of the links! You are young, and you are a friend of time.